Emma Ruth Rundle is one of those artists with such a deep-seated, personal aesthetic that it runs like a coal-seam throughout all her work, whether that’s jamming with Dylan Carlson, playing in post-rock trio Marriages, or on her darkly ambient solo records. Her playing was honed during a 10-year stint in a guitar shop, combining a “bastardised fingerstyle” that cribbed lesson fragments from passing classical and folk tutors with sizeable effects montages and the dark intelligence common to many of her Sergeant House label-mates. 2016’s stark second solo album Marked For Death provided a breakthrough, or at least something approaching the sort of recognition deserved by a deeply emotive guitarist and tonal conjurer. Now she returns with On Dark Horses, a grounded but unguarded collection, recorded in her newly adopted Louisville, Kentucky. 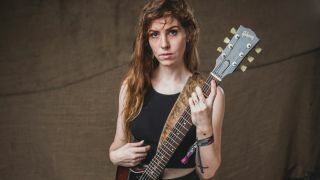 We spoke to the guitarist, songwriter and frontwoman about her use of open-tunings, creating narrative with guitar tone and the surprising role of acoustic guitar in her heavy songcraft. How would describe your approach to guitar playing? “I guess there’s different approaches, depending on whether I’m writing a song or playing in a band. What hat you’re wearing at the moment is in terms of approaching the job or the task. Why is the acoustic the starting point? Do you think that resonation explains the long ringing notes in your electric work? “I’m not sure if it does. It might have more to do with the open tunings. There’s a lot of open strings that get called upon, and those notes will ring through long passages of songs, because you’re not fretting them. That could be some of it. “A common one that I really love is like a DADGAD tuning but dropped down so my lowest note is a G#. So it’s quite a low tuning – even below a baritone tuning - and I’m doing that on a regular scale-length guitar on the acoustic and that works out. The DADGAD tuning I really like. What’s your go-to guitar gear at present? “So the acoustic go-to is a Blueridge OM-copy, so that Martin body-style – your basic mahogany back and sides, spruce top guitar. I have a classical Cordoba that is also pretty standard that I play a lot. “Live, I like to use a Jazz Chorus amp and I like to run stereo amps, so I have a Jazz Chorus and I’ve been borrowing various Fender tube amps lately, preferably something with a 1x12, just to get that tube sound on one side and then that super clean side. “The Jazz Chorus really works well for the drop-tunings. You get super-clear bass notes, but then with the tube amp, you get some more of the biting mids that warm it up a little. It makes it less sterile, I guess. “For this last record, I’ve been playing this Guild T-Bird guitar. It’s beautiful. It’s white, it has two humbuckers and it’s the only guitar I’ve ever named. I named it ‘The Cloud’. It has a tone that’s similar to my SG. Are there any essential pedals we should discuss? “For me, the pedal that has remained on my board the longest - my favourite pedal - is the Electro-Harmonix Memory Man with Hazarai. That’s my pedal. I’ve had four of them. “I’ve had the digital Reverb by Boss on my board for years and I’ve just taken it off so now I’m using the DigiTech HardWire series reverb that I really like. It’s got a really cool reverse reverb setting that is really dreamy – just super-great for pure washes of texture. It’s a beautiful sound. I love that pedal. Then any regular Boss delay. I’ve always got one of those. “I’ve also really come to be very attached to the EarthQuaker Devices Palisades, which is an overdrive/distortion with a boost. It has two different gain channels: you can turn it on and then have another gain that has a totally different tone and then a boost that will boost on either of the A or B switches. It’s just got this beautiful, super-intensive growl that has a lot of low-end to it. What should tone do? What is the role of guitar tone in your writing process? “It really evolves. It needs to suit the role. For instance, there’s a song, Darkhorse, on the album. We have these heavier tones going on in the chorus to create an impact, and then there’s a bridge section that’s this kind of post-rock moment, a fingerpicking passage with clean tone. It allows the interplay between the drums and the guitar which creates this effect that’s supposed to be like you’re surrounded by horses. “Yeah, on the last record I was like, ‘Okay, here’s the part of the song where there’s this owl that’s going to come out of the tree for like three seconds and then go back into the tree. And I was just working with someone… Sonny [DiPerri, Marked For Death producer] understood that, you know? I’d be like, ‘Okay, we need to add some dust to this part’ and then creating that. “Working with Dylan Carlson on Conquistador was so much fun for that purpose. Dylan was just like, ‘Hey, do you wanna come make this record with me?’ And I was like, ‘Absolutely, Dylan Carlson of Earth, I would love to make a record with you.’ The guy is one of my heroes. Hex has been a huge influence on me. What does this record say about the time and place it was made, outside of your own life and geography? “I think that if we’re talking about the emotional content, there’s still a lot of themes that are similar to the last record. There’s no social commentary really going on in the album. On Dark Horses is out now via Sargent House. Emma Ruth Rundle tours the UK in November.